Festival glass use a wide range of high firing ceramic coloured inks, which are fired at a very high temperature. During this process it is possible for the shading of the colours to be altered slightly. It is also important to acknowledge that colours viewed on a computer screen can differ from screen to screen and are not a true reflection of the actual colour. This can also be experienced in everyday life as colours may appear a different shade of colour to the naked eye depending on the type of light it is viewed under and the material it is printed upon. Festival Glass use the universally accepted coated Pantone Colour System for the ceramic paints we offer. For the most accurate colour matching we recommend choosing from our recommended ceramic colour chart. 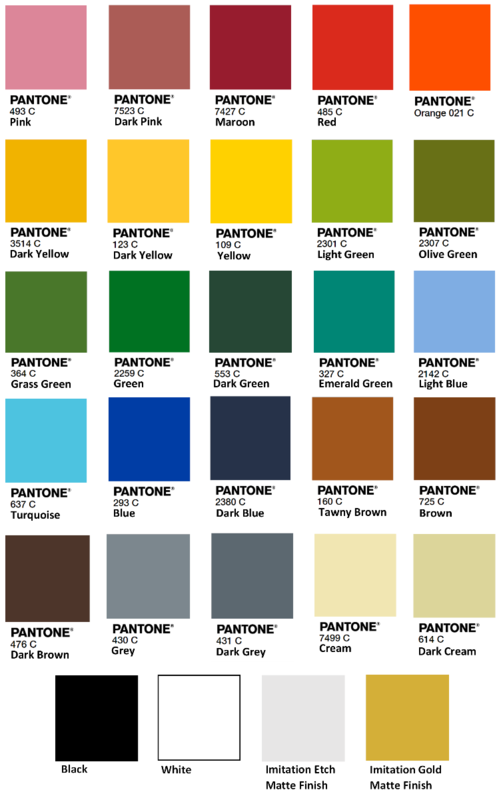 However, Pantone colour matching can be achieved upon request, although some colours may be subject to additional costs.